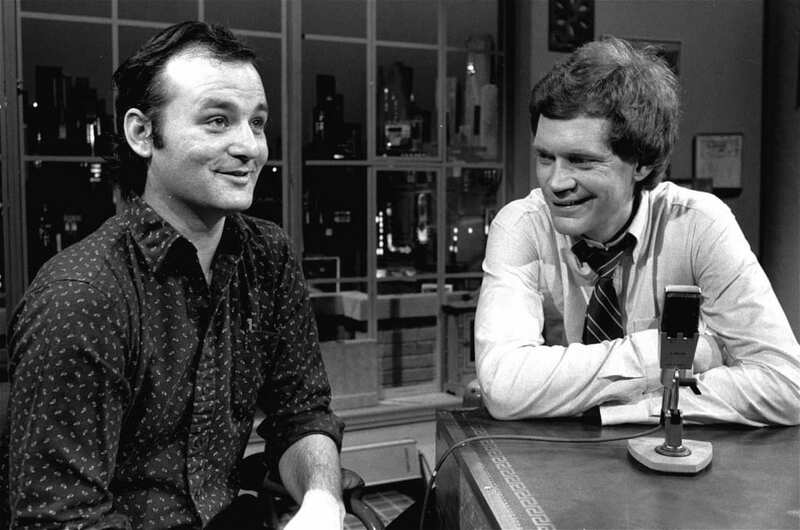 It’s about a three hour drive on I-65 from Indianapolis to Chicago, but with brands of humor so similarly absurd, affable, and audacious, Bill Murray and Dave Letterman might as well have grown up in one another’s backyards. Over the past thirty-three years, before our very eyes, the two have developed an incredible rapport, one that inherently grew from an increasingly intrinsic relationship. Were there no Dave, all we’d have are Bill’s rather transactional appearance’s on Johnny’s show (sidenote: how about Akroyd and Murray’s cowboy boots)? And without the occasion of Bill’s appearances, Dave would have one fewer ally in the fight against sarcasm, one fewer friend to lean on in times of need, and many fewer nights where he’d give belly-filled laughs and allow a nation to overflow with glee. Lately, Bill has taken to appearing in one-or-another of Susan Hum’s wild costume designs, and we are all the better for it. First, Paul and the band play “Chest Fever.” Then, Bill cakes the audience and hugs Dave, caking him in the process. If ever there was a better way to describe Bill Murray it would be, he’s the type of guy who can turn a noun like “dessert” into a verb. Seeing as how Bill was Dave’s first guest on the old show, and his first guest on the new show, it’s appropriate that tonight, he should be his last guest. Let’s take a look at some of Bill’s best appearances. Where it all began. From Chinese restaurant pandas named “Cancun” to Dave’s “So now that you’re well-known is it harder to be funny?” to Bill’s impromptu take on Olivia Newton-John’s “Physical,” it would soon prove to obvious to ignore: these two were made for each other. About six minutes into this appearance to promote all-time classic Groundhog Day, Bill offers his unique vocal styling talents to belt a doozy of a theme song for Dave’s show. For the next several years, whenever something was a bust, my high school buddies and I would shake our heads and say to one another, “milkmen and snake charmers.” I’d forgotten it had come from Bill Murray. “Stay out of it, Davey.” The Heckler. Classic. Liberace. After the break, so much insanity ensues, ending with Bill’s take on Dolly Parton’s “I Will Always Love You.” Oh, Bill. Paul Shaffer’s book makes a pretty hilarious mention of Bill. And then, there are leaf blowers. Bill’s on crutches following a skiing accident while attending the Sundance Film Festival. Park City? More like Parka City. Wait for the leg elevation bit. 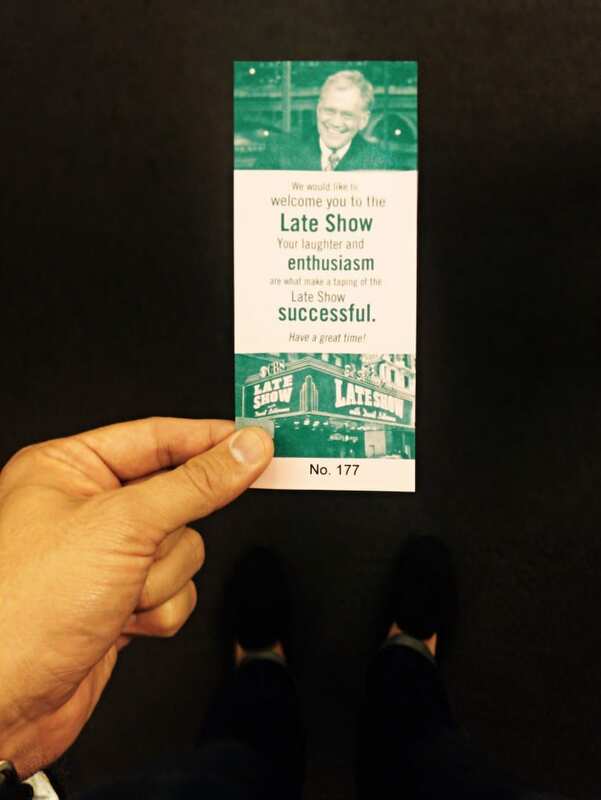 Further proof that the Late Show staff really goes all out for Bill. Here’s one for all you bourbon lovers. Tom “Bones” Malone has quite the cannon on him. And that does it. It goes without saying, I am incredibly excited for (and a bit stymied by) Bill’s forthcoming Christmas Special on Netflix. 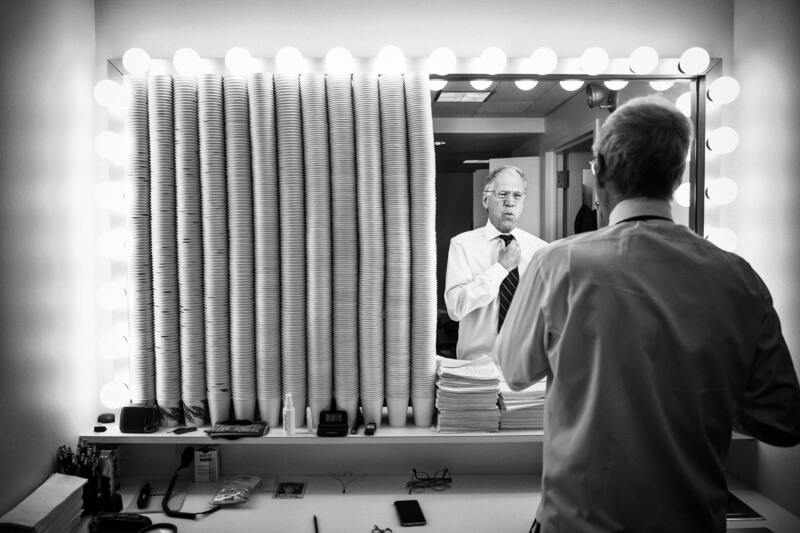 At the 35th Annual Kennedy Center Honors, David Letterman was honored for his Herculean television achievements. There are so many fat pitches in this seventeen minute clip (“Tina, does Dave talk to you?”), and it’s worth watching the entire thing, if only to watch Dave squirm sitting next to the Led Zeppelin boys. And a selfish in-joke: for those who’ve met my mother, you’ll appreciate this. In the montage featured in this clip, look for the first Top Ten list entry with this story in mind: for the first time in the seven years I’ve been remiss in regularly updating All Plaidout, my mother recently called me and said, “I’m calling because I’m worried about you. I went to your blog the other day, and I thought you might be dead.” Thanks, Mom. Before I knew anything about Tom Waits, I knew Dave was a massive fan. Waits has appeared on one or the other of Letterman’s shows ten times. It wasn’t until I saw Down By Law, Jim Jarmusch’s pulp fiction, jail break picture starring Waits, that I understood Dave’s fascination. From watching Jarmusch’s black-and-white, soupy bayou yarn about three escaped convicts, I could tell implicitly why Dave did everything he could for Tom. For Waits, like Dave, is this somewhat reclusive, creative, punkish American everyman, able to speak to the people of his time by needling together all that has come before, occasionally paying homage, but most of the time poking at it for effect. Here, I have compiled all-but-one of the ten known appearances available, with a sprinkling of notes on certain performances. Come for the music, stay for the interviews. Who cares if this was staged? It is awesome to watch Julia Roberts flatly call him out for failing to send flowers, and then like clockwork, watch as Pat Farmer strolls in with roses. Then at 6:45, all hell breaks loose. Part One of her first appearance on Late Night. Freshly turned 22, she was there to promote Steel Magnolias in 1989. And a pig. And a dog. And my personal favorite: Roberts revealed in 1993, after the above appearance, she’d asked Dave to attend the premiere of Steel Magnolias with her. Fallon and Kidman, eat your hearts out. In the summer of 1993, I was twelve years old. It was the last summer I played baseball. It was the summer before I started at a new school, an all-boys school, one that molded my worldview as much as anything. I was a member of a whopping three swim teams. It was the first and last summer I played on an organized roller hockey team on an actual sport court in a city park. After all, it was 1993. 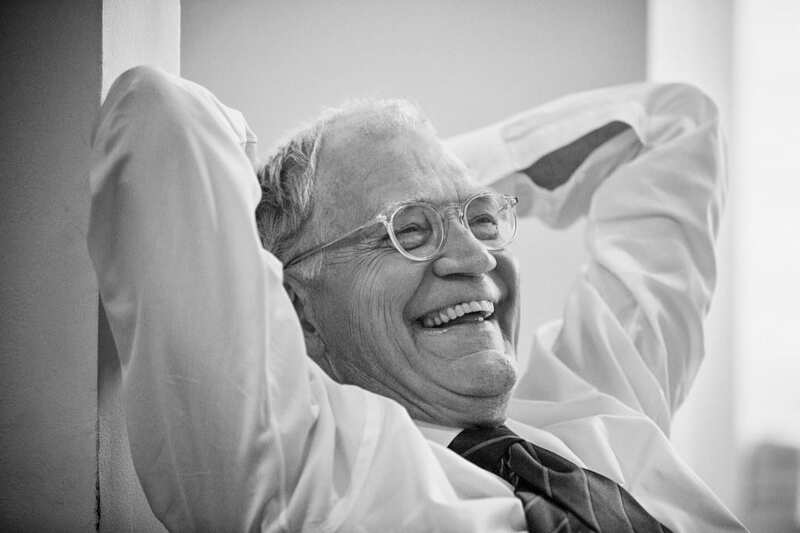 And late in that summer, I became the world’s biggest David Letterman fan. As my last summer before becoming a teenager came to a close, on August 30th, 1993, CBS debuted The Late Show with David Letterman. Prior to that, rare was the occasion when my folks allowed me to stay up past the end of The Tonight Show Starring Johnny Carson. I did know that Dave dropped televisions, watermelons, and bowling balls from tall buildings, and he’d have controversial guests with whom he’d occasionally argue, and I knew about Stupid Pet Tricks and velcro suits, and because of all this, my mother did not like him, which obviously made me even more fond of him. As of today, we have one more week with Dave, and I have been tapping into my early fondness for his show in a big way. Facing Dave’s impending retirement, I’ve become more wistful. In retreading memories, it’s become clear to me that discovering Dave Letterman signaled my transition from a boy to a young man. For a little over three years, the three years I was old enough to be allowed to stay up until 11:30 and yet too young to drive, I was an avid fan, taping many of the episodes, rewinding and poring over the structure of his jokes, his cadence, developing a keen eye for his trademark folksy, Midwestern turn-of-phrase. I never liked the double-breasted suits, the grey socks, the tasseled Cole-Haans, but I liked his “Hee, hee!” I liked his good-natured self-denigration. And I especially liked that he rooted for the Midwest, land that I love. When watching, I had a routine: push-ups during the monologue, sit-ups for the first commercial break and through the end of the Top Ten, and then, I’d do some pretty intense stretching while he interviewed his first guest. For a time, I remember being able to lay flat on my back, point my feet, and touch the carpet with my toes. Talk about Stupid Human Tricks, but at least my swim coaches were impressed. Patrick gets Dave’s socks, January 16, 2009. In thinking of how I — Max Wastler, lowly style blogger — might best pay tribute to this man whose efforts have meant so much to my understanding of the world, I had a thought: let’s all wear grey dress socks and tasseled loafers on Dave’s last day. We could call it #SocksForDave. I’m going to go ahead and pull the trigger on a pair of the Grey Russell Ribbed Dress Socks from Ledbury. Fingers-crossed, they will arrive just in time. I filled out the online submission in attempt to attend the taping of one of his final shows, but because I was lucky enough to make my way into the front row of the taping of an episode last fall, I assume I’m on a “no fly” list. If you’re reading this, and you’re in New York, and able to take part of your day to wait in line for waitlist tickets, do so, and clap a little harder, cackle a little louder on my behalf. “Ya got any cups?” Each one represents a completed show. Speaking of attending a taping, it is precisely as its described at the beginning of this lovingly told profile from The New York Times, from which the black-and-white photography featured here was borrowed. He does wind this dented microphone around the stage like The Who’s Roger Daltry or like its Indiana Jones’ whip. His warm-ups often show up when he first sits down at the desk. The in-joke he’s able to craft and the cutaway to the darkened audience member with whom he shared the repartée still make me smile. Deep in the piece, when he’s approached today, he refers to feeling a sense of “artificial reverence.” Were I to agree with him would defeat my efforts here. I have utmost respect for Dave, and it’s my hope in reading the forthcoming posts, you’ll understand precisely why. 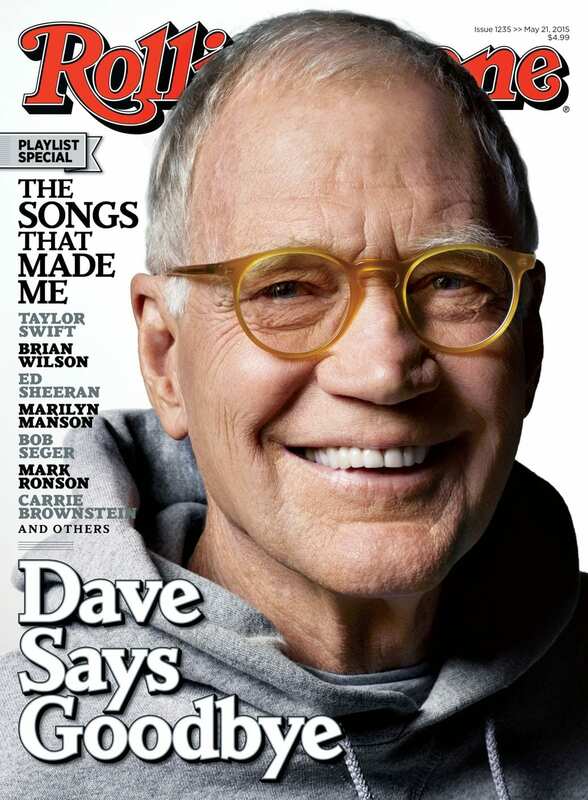 I’ll end by saying, it’s also worth picking up the most recent issue of Rolling Stone with Dave on the cover. Josh Eells’ lengthy article is incredible in its scope: detailing scandals, his introversion, the early insecurities, and a beautiful portrait of Dave’s life in Montana. Stay tuned to All Plaidout this week for more stories about Dave Letterman as only I can tell them. 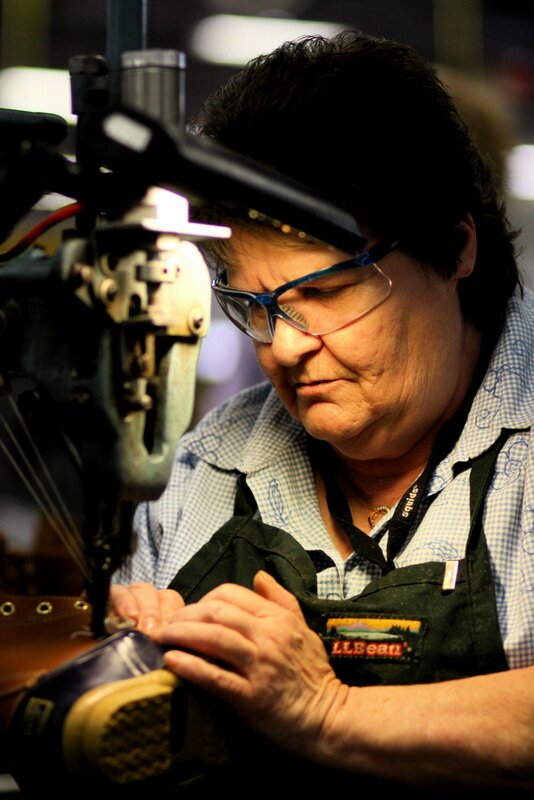 With recent news of a boot shortage at L.L. Bean, I thought it would be a good time to take a look back at the first-ever factory tour I took with Foster Huntington way back in March of 2009. 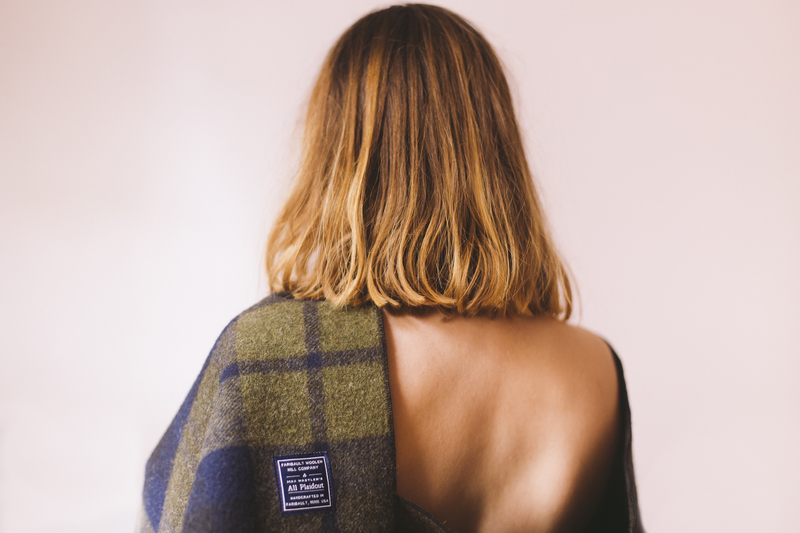 When the time came to name this All Plaidout, a blog with posts about things that are not trendy, about the stories of style over fashion, about the stories behind the clothes we wear, I turned to the rich history of a cloth pattern known as a tartan. I chose the tartan most emblematic of my style, my appreciation of history, and the one that most often showed up in my closet from as early on as I can remember, the Black Watch. 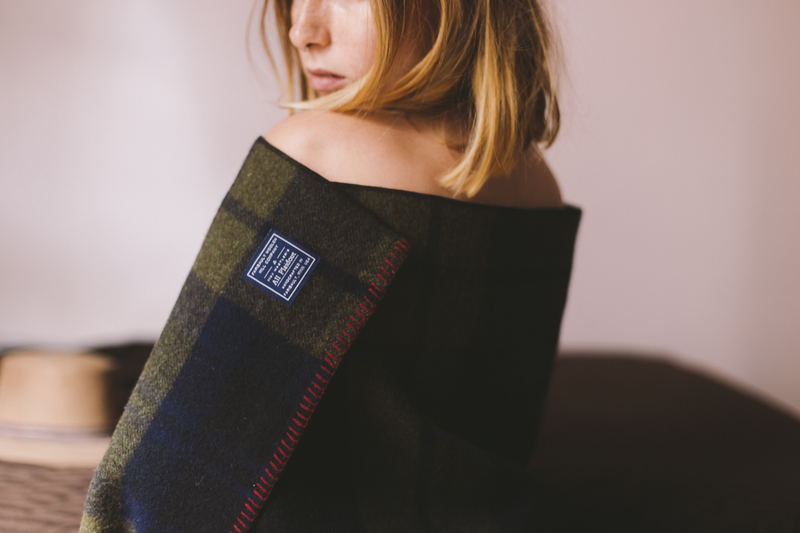 A dark, neutral tartan, it was first worn by the watchmen, highly trained members of the Scottish military who’d combined their clan’s patterns to stand as one. 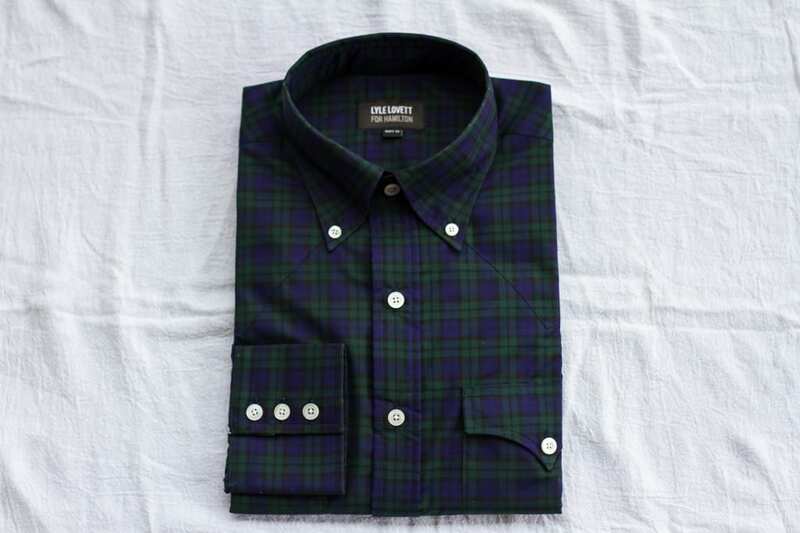 Owed primarily to its widely appealing aesthetic quality, it has become one of the most popular and sought after plaids. 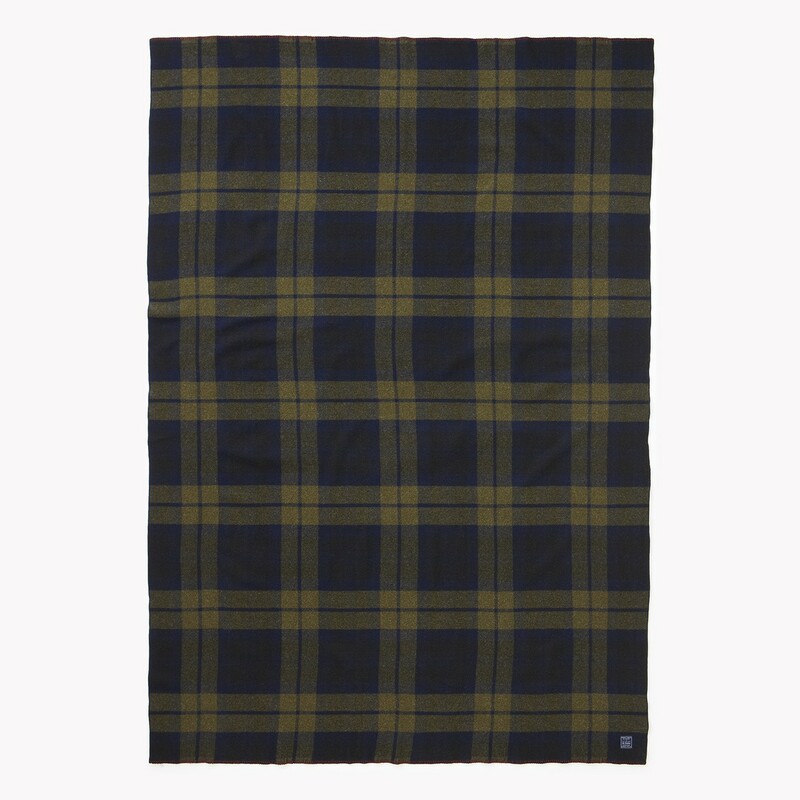 When collaborating with John Mooty at Faribault Woolen Mill on a Black Watch plaid blanket, he offered a unique suggestion. “Let’s ground it in the threads of the U.S. Military blankets for which we’re most well-known,” he said. 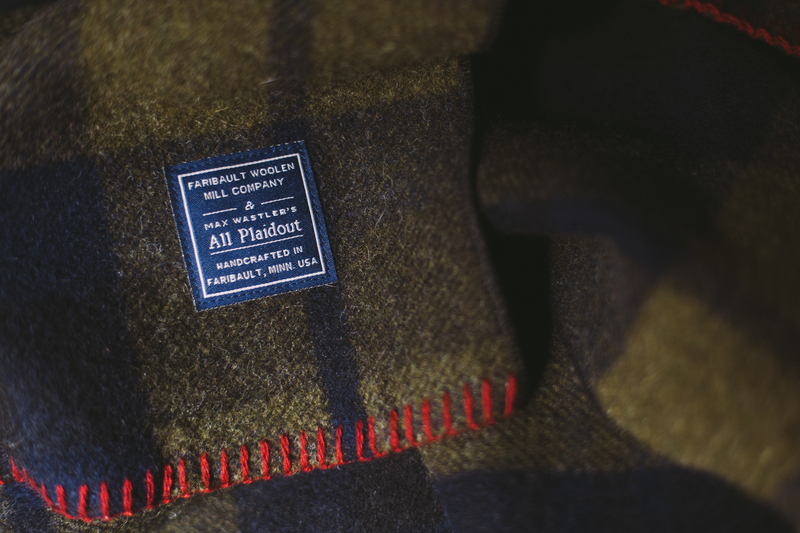 By combining the green from the U.S. Army, the blue from the U.S. Navy, and the black from the West Point Academy blankets, Faribault has created a subtly new, beautiful, and altogether American take on a pattern with a rich and wonderful history. 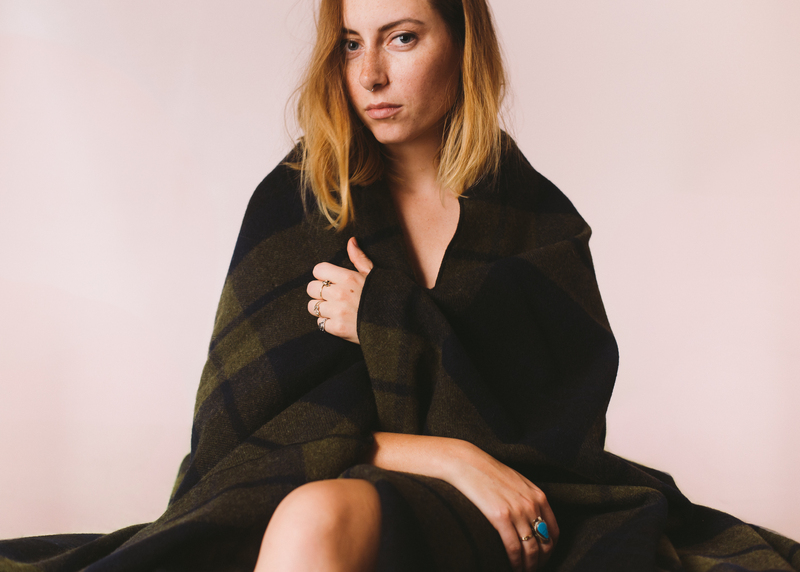 To capture the evocative nature of the fall blanket, I turned to Carolina Mariana Rodriguez, whose self-portraits fill a frame with emotion and texture, a feeling that extends far beyond a model draped in a blanket. 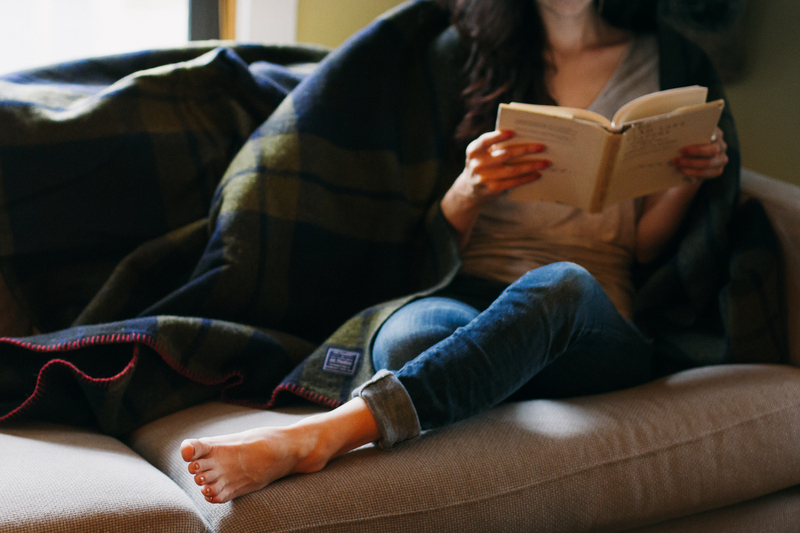 As for the blanket itself, far from those rough ones I remember wrapping myself in while sitting on the bleachers at high school football games, these thick, warm blankets are made of the same MIL-SPEC yarns as those that protect those whose job it is to protect and serve the rest of us. 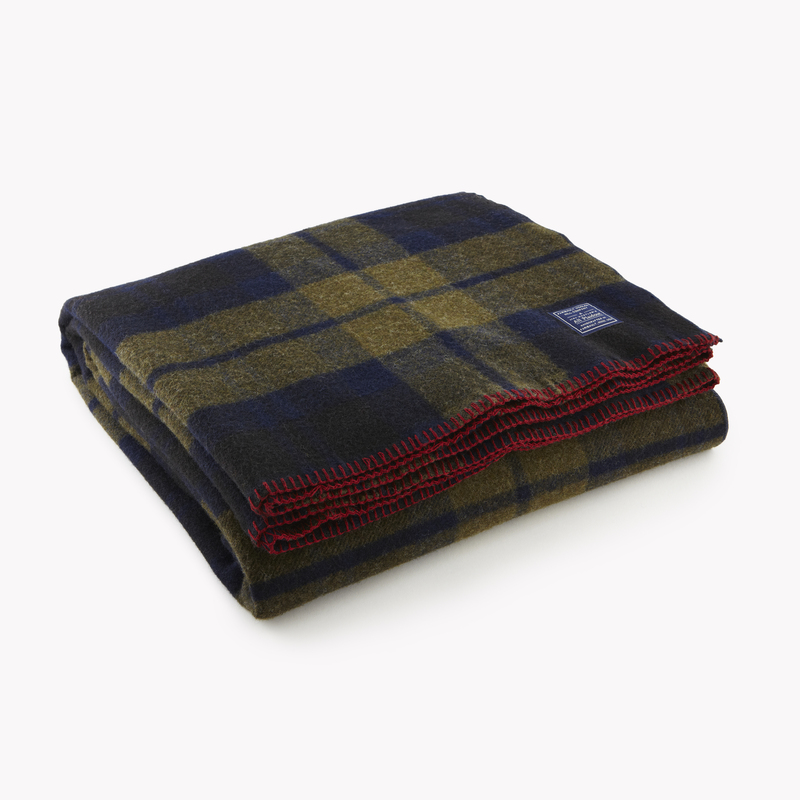 Finished with the flourish of a red-yarned whipstitch – which too nods to the various derivations in the Black Watch plaid, a red line in the pattern signified at times difference in rank or platoon – every effort has been made to ensure each blanket provides the utmost in functionality and comfort. 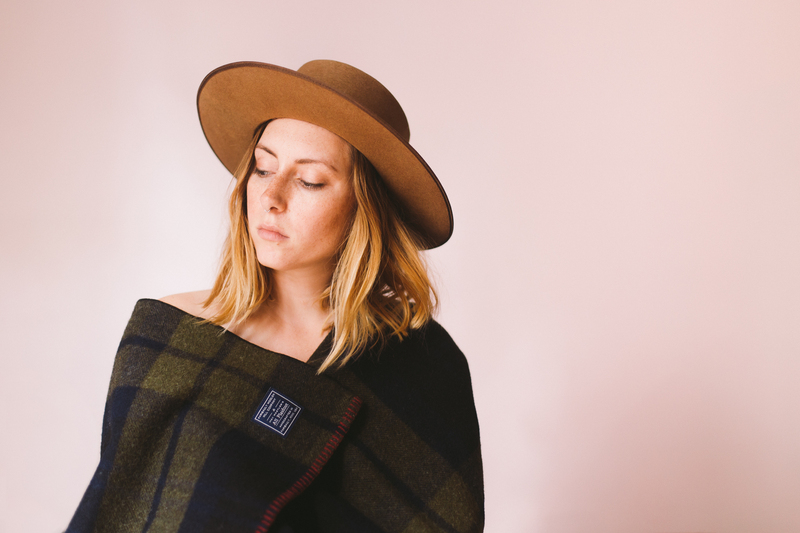 Read Laura Pearson’s piece on blankets in the Chicago Tribune, featuring this blanket. All photos courtesy of Carolina Mariana Rodriguez and Kyle Smith. 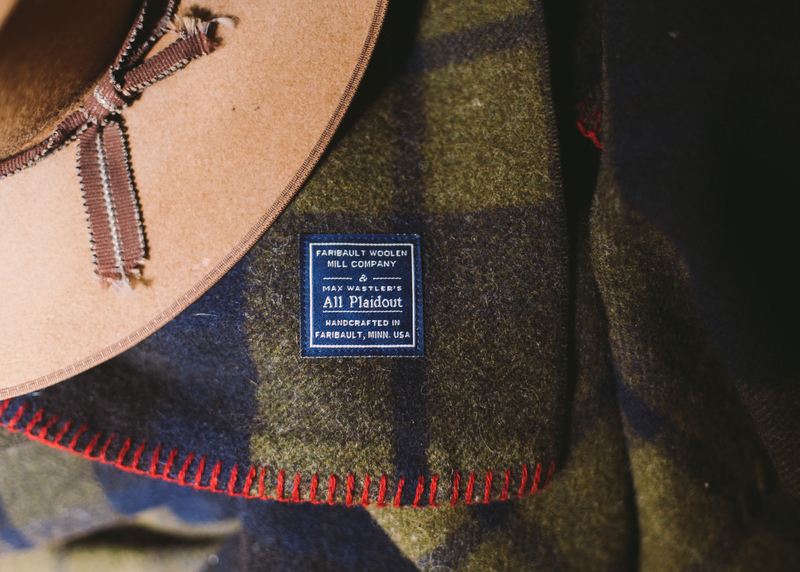 *Ask for the “Shadow Plaid Foot Soldier” blanket with the All Plaidout label anywhere Faribault Woolen Mill products are sold. I recently took a trip to Houston, and while I was there, fourth-generation shirt maker, David Hamilton measured me for this custom Lyle Lovett for Hamilton Shirt. I’ll be sharing photos from the factory very soon, but I couldn’t wait to share the shirt.